Immediately following his death in 1799 at the age of 67, a plan was proposed to reanimate the corpse of George Washington. 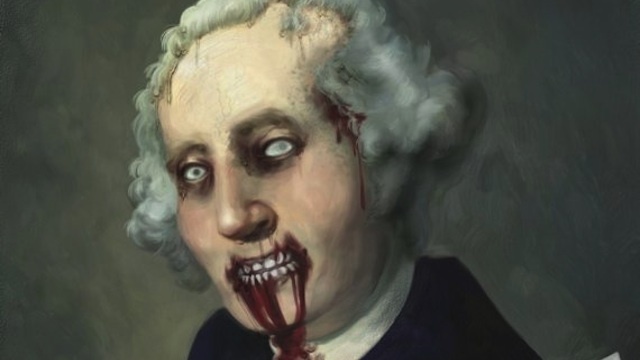 The strange but true tale of raising up the first President of the United States as one of the undead is found on IO9.com's Secret History feature. It's long been known that Washington likely died from waaaay too much bleeding at the hands of physicians who were trying to treat the great man's case of sore throat. Back in the day it was prevailing wisdom that one of the primary causes of illness was "bad blood". Get a flu or fever or something and the village doctor would come over with his bloodlettin' instruments (or in some cases, live leeches) and commence to draining the precious red vino of life from your veins. And that's what happened to poor George, who probably would have survived the sore throat if left to his own devices. Anyhoo, Washington's body was put on ice until time to bury him (he'd instructed that to wait a few days so he wouldn't be prematurely buried). And that's when William Thornton comes into the story. The designer of the United States Capitol building had the radical idea of thawing Washington's corpse with blankets, then pumping the lungs full of air and giving it a transfusion of lamb's blood (thought at the time to have magical reanimation powers). This would, theoretically, bring George Washington back to life. Washington's family didn't give Thornton a chance to attempt his experiment. Maybe it was for the best. Mash down here for more about the saga of Zombie George Washington. I thought George W. Bush was the first Zombie president.